Lately, I have been pondering how to help educators better visualize a progression of learning targets while warning them to avoid the linearity that seems so obvious. When first observing a progression, the continuous increase of complexity is hard to miss. So it is easy to conclude that students should finish the first step, then move to the next, complete that, and then the next, constantly ascending the ladder of learning. The problem with this vision is it does not represent how thinking and learning occur. Learning is not a constant. It ebbs and flows like the incoming tide on a coastal beach. Missing this can lead to using the progression as a checklist of skills and not fully using the advantage given by having a well-defined continuum of learning targets. The power of a progression lies in its ability to make clear to student and teacher which learning outcome is centered in that student’s zone of proximal development. Without knowing what students have already mastered, been exposed to, or are just beginning, educators risk attempting to engage students in learning that is too low or too high. If we assume all students are at the same level of readiness simply because they are all in the same grade, we risk boredom or stress. In an earlier post, I talked about the stress caused by a lack of clarity in teacher expectations. Learners need the right level of stress in order to foster the attention needed to have a good performance. Too little pressure and we are bored; too much and we become fatigued and exhausted on our way to a breakdown (see graph). Learners need to be in the comfort zone. A learning progression will help identify where that is for each individual. Education cannot become a 19-point tune-up, marking that a student needs this, so do that, and then check it off. We want to use the progressions to create more deep learning opportunities that require students to apply the knowledge learned. We want learners to work in ways that encourage them to practice being autonomous while developing mastery during a search for purpose. Why do we teach? To develop learners ready to take on the challenges of their lives. A checklist can minimize the learning. But clarity in what we want students to know gives us the guideposts we can use to facilitate their learning opportunities. My experiences growing up, training animals, raising my own children, and working as a teacher, all gave me the awareness that learning does not happen in a steady march forward. Even as an adult learner, it is never smooth. My latest interest has been learning to play the bass guitar. Some days I play like a pro, jamming on stage with my rock heroes. Then, on other days, I am lucky if I can run a C major scale. That is all right. I am learning. Each day I can see definite signs of improvement. As we learn, we have spurts forward, steps back, stumbles across, and triumphs both large and small. Out abilities ebb and flow but always gain. 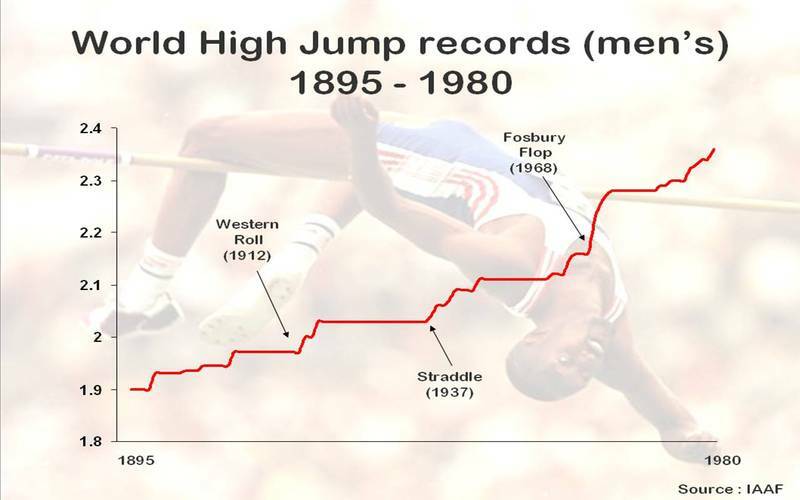 One day while sitting at my son’s track meet, I studied a graph of high jump records over the years. I began to notice a pattern. As the athletes learned a new way to jump, there was always a giant leap forward. This was then followed by a slight up and down pattern, almost like a wave, before finally leveling off. This flat line continued until the next innovation was learned and the pattern repeated. For instance, following the introduction of the straddle in 1937, there was a sawtooth increase in the record height over the next 10 years. This wave like pattern continued until it finally flatlined for many years. The next innovation, the Fosbury Flop, was introduced in 1968 and it was followed by another sawtooth increase as the athletes learned the technique. The pattern looked like the waves of the ocean, ebbing and flowing against the beach. High crest followed by a decrease followed by another crest. But unlike with sound or a similar vibration with a series of equal crests and troughs, this wave kept increasing in height. Learning does not increase in a steady flow like a bucket being filled by a garden hose or have equal amplitudes like the waves of a violin playing a note, but we know it does build with experiences. Learning is not like a person walking up a ladder. It is not about taking steady steps forward like a marching band heading up a field. Knowledge builds to learning like the tide on a beach. It ebbs and flows with the waves of new knowledge. A student might sway back and forth between level 5 and level 6 of the progression, possibly even be pulled to level 4 momentarily. But, when granted the time and given the ability to move with the waves, a student will move forward through the progression. The ocean waves propel water up onto the beach, then pulls it back to the ocean. Over time, the beach becomes covered with water at deeper and deeper depths. Learning progressions are like points on the beach. They are touched by a wave of knowledge, then covered, and finally engulfed. The depths of understanding continue to grow over the knowledge that has come before as the tide continues to come in. The next thing to ponder is how we measure to make sure the tide is rising. Bill Zima began his career as a zoo educator. Seeking something that was a bit more dynamic, he became a 7th grade science teacher. He is currently the superintendent at RSU2 in Maine. He is an original member of the Maine Cohort for Customized Learning, an organization of educators dedicated to the promotion of performance-based education systems in Maine. He is the author of "Learners Rule: Giving them a voice improves the culture of their classroom." You can follow him on Twitter (@zimaw) or reach him at zimaw (at) yahoo (dot) com.